Felix Mendelssohn’s forty-eight exquisite Songs Without Words met with mixed opinions when they originally appeared. Composed throughout the 1830s and into the early 1840s, Mendelssohn seemed to defy the penchant of the day to compose the kind of ultra-virtuoso works that had made Franz Lizst and the like international sensations. These little gems are certainly based on the lied, and often take on the typical three-part song form in which the opening material returns with some sort of variation. Also, as in many songs, Mendelssohn provides an introduction and a postlude - the lovely Op. 30, No. 3 is a fine example. Schumann was led to speculate that the composer might have even had a text in mind when he conceived each piece and simply left it out when he composed the music. In spite of their simplicity of harmony and clarity of melodic line, there are many technical challenges in this music. Left hand accompaniments are often made of wide leaps that begin with a low octave followed by a full chord some distance away. This is not an easy thing to execute even for the finest pianist. Mendelssohn was himself a first rate pianist and many of the songs require fleet finger-work and the ability to fly through note-laden passages with deft ease. Yet even in the more speedy ‘songs’, there is never a lack of beautiful melody. The slower works are almost hymn-like in their serenity. Roberte Mamou is new to me, but certainly no disappointment. She has ample virtuoso technique and displays a sensitivity to balance and inner voices that is quite refreshing. 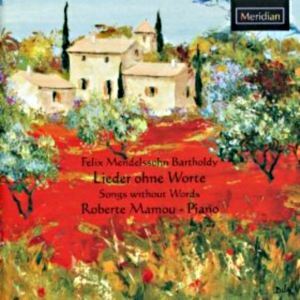 There is the occasional tendency to over-use rubato, making Mendelssohn’s more classically-orientated style come across too much like the more blatantly romantic works of say Schumann or Chopin. That is a small complaint in what is on the whole a splendid two hours of music-making. It would be easy enough to fall into a sort of sameness trap in these works given their similar style and structure. Ms. Mamou, however finds the individuality in every song, making each little moment fresh and pleasant. Meridian does not provide recording dates or locations, and the program notes are, well, long. There is a lot to cover, but I have never been fond of blow-by-blow descriptions of music. I find that most listeners are smart enough to figure out what is going on by using their own ears, and I confess that it was a labour to get through all the descriptions. A good proof-reader would have been nice too as the typos are fairly abundant. Recorded sound is of the first order. There is plenty of warm reverberation and yet there is perfect clarity as well, nicely accenting Ms. Mamou’s fine ability to sing with her instrument. Her biography touts her recent Mozart sonata recordings, comparing them amusingly to those of the late Glenn Gould. One can’t quite imagine how anyone could perform Mozart and remind the listener of Gould’s highly idiosyncratic playing, but that’s a discussion for another page. In all, this set is a worthwhile investment; an ample helping of beautiful music played beautifully.